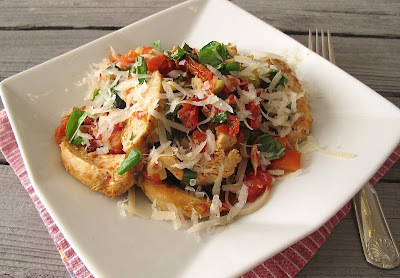 Fresh garden tomatoes and basil with chicken set over pasta, and dinner can be ready in about 15 minutes! To a heated, medium size non-stick pan, add olive oil and seasoned chicken breasts. Cook about 4-5 minutes a side, remove from pan and set on cutting board. Add wine to pan, deglaze and reduce. Add butter if needed, stir in tomatoes, garlic, olives and basil. Drain pasta, top with tomato-basil sauce, sliced chicken and Parmesan. Garnish with additional torn basil leaves.